Sponsorship as defined by the 12 Step programs is a formalized relationship between two people in recovery, one who guides the other as s/he goes through the twelve steps, reads and studies the main text of their program (for alcoholics it is the Big Book of AA) as well as other “conference approved” literature. The sponsor is also there to be a listening ear, the person on the end of the phone (or email or text) to help one avoid relapse. It is a relationship that is integral to the 12 Step program of recovery. One gets a sponsor, develops that relationship and some security in recovery and then one BECOMES a sponsor, embarking on one’s own experience of service and connection – finding ones own skills at sharing, guiding and listening. For some people this relationship is the first comfortable experience with a safe mentor. That in itself is a gift of this paradigm: student and teacher, being with someone who sees you as you are, listens to you as you are, loves you as you are, and guides you to be an expression of your better self with unconditional love. Receiving this type of care can be uncomfortable. Being witness to another persons growth (rather than managing it) can also be uncomfortable. Both sides of the relationship offer opportunities for personal development. In early recovery one’s ability to discern a healthy match from an unhealthy one, the healing from merely the bossy or controlling, may not be as refined as it will be. 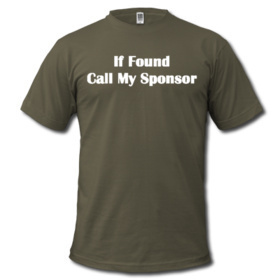 There may be false starts in finding a sponsor who can guide one well. If I am more accustomed to being bossed around I may find a sponsor who is controlling or judgemental, thereby put off developing my own internal strength. I may find a sponsor who will tell me what meetings to attend, exactly how and when to do the steps and may give me a lot of advice about decisions I need to make in my life. I may go along with this for a short while or a long while. In doing what another says, I may be giving up responsibility for my own actions. In avoiding making my own decisions and I lose out in finding strength in both my own mis-steps and successes. If I recoil from any type of suggestion and resist change I may initially select a sponsor who will not challenge me or have boundaries. I may recoil from “being told what to do” preferring instead to approach recovery in my own way, doing the steps in my own time frame in my own manner. I might choose a sponsor who does not challenge me or does not suggest definitions of the relationship. without boundaries I am free to engage in the program as I see fit. I find someone I am comfortable with rather than someone who offers me development. It does not matter in the long run if your “selector” was not operational when you found your first (or second) sponsor. When you discover the need to find a new sponsor; discuss it with your current sponsor and make a change with care and kindness. Having a mis-match with a sponsor can sometimes have you drop away from the relationship – without replacing that guide. Deciding not to have a sponsor can bring isolation; isolation can bring relapse. Best to find a sponsor you can work with. What happens once you go through the steps, work through the literature and gain some time and security in your recovery? What is the sponsor relationship like then? What is it for? Stay tuned. More on sponsorship in the next few days. PreviousPrevious post:The Spiritual Practice of Saying "No"NextNext post:Having a Sponsor- the "Middle Years"